After seeing countless gray and white rooms in magazines and around the blogosphere this year, artist Elizabeth Chapin’s colorful house in Austin really woke me up. 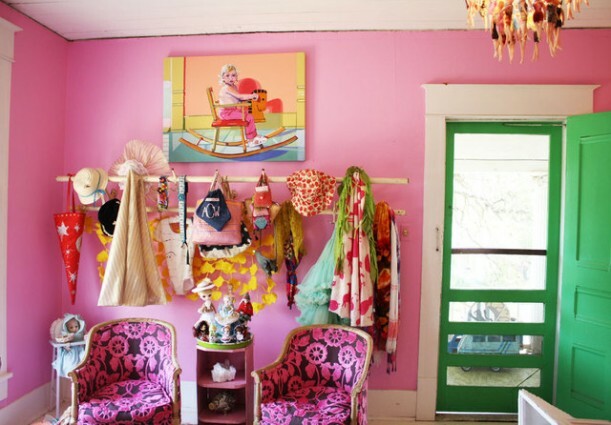 You can tell that a bold and creative person lives here, and that she treats her rooms like an extension of her art. She lives here with her husband Nathaniel and two children. When was the last time you saw an orange and pink kitchen? My daughter Lily loved this house, but she really flipped when she saw this pink bedroom with the canopy bed and the big doll house. Could you handle this much color in your house? I couldn’t, but I think Chapin’s sense of creative fun is inspiring. I could use a little more of that spirit of adventure in my decorating. 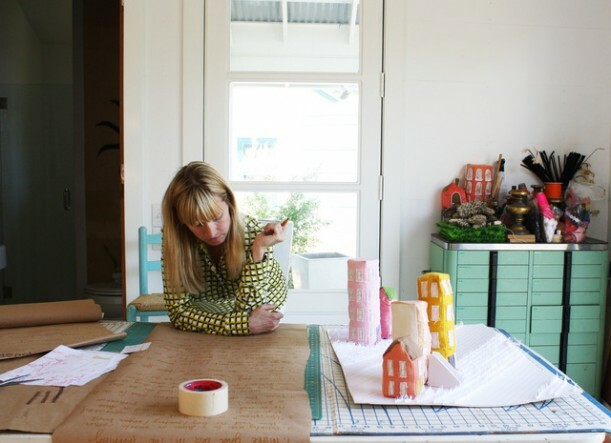 Read the interview for more details and see many more photos of her house at Apartment Therapy. 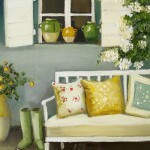 Visit Elizabeth Chapin’s website for more information about her artwork. You know what? I’d love to meet this woman! I saw her house and I smiled! I don’t have the guts to have this much of color in my house, but this is fun! It’s summer all year round! By the way, that settee is just so beautiful! I like color, but more toned down. Looks good the way she put it together. I like some of her decorative touches more then the rooms themselves. Interesting for sure, but I would tire of it quickly! So funky and welcoming! I love all the bold colors! I don’t like it for me at all — far too stimulating — but somehow it all works together, especially when you understand that it’s an artist’s home. It’s very bohemian. For some reason, it reminds me a little of Jennifer Lopez’s character’s place in Monster-in-Law. I visit often and rarely comment but this moved me to do so. I love this house! I’m so everlasting tired of white/beige/gray/greige and this house is the perfect antidote. C’mon – who’s gonna see the dust bunnies with so much to admire. Love it! The settee, the bathroom floor, wow! This home is exuberant and fun! I liked the pale gray and taupe for the first 500 homes but now, yawn. Wow! Very fun I love the lime green bath!! I love color, some is a bit much, however it is great to see! I LOVE, LOVE, LOVE this house – did you notice (yes, I’m sure you did!) the Keep Calm and Carry On poster in the wonderful kitchen? – LOVE it! I live in an old house (in the Deep South), very similar to what I can see of hers–board walls, ceilings, and floors. I have a room which was added to the back, the original exterior wall being a wall of the room; there are windows in that wall with two big cabinets in front of them. I don’t think I am brave enough for all that color, but I love it, and my “decorating” is kind of like hers, more accumulation than selecting. I liked this post. Wonderful! I’m here in Austin; I wonder if she ever gives people tours. Love that home! How fun! Not sure if my family could handle it, though. Maybe for that beach house I don’t have, yet. I love this house! All white, or careful, neutral rooms can be beautiful, but they’re often boring. I am always drawn to colorful decor. This house makes me smile (in a good way). It’s a little too much for me, but I think the pink and orange kitchen is so cool. And the dollhouse? Get. Out! so authentic and fun. alive. happy. love it. I have to say “I love her home”. All the colors just sing to me and make me happy. And I wouldn’t believe that I would ever say I like a pink and orange kitchen…but I like hers. And I love the two colorful crocheted spreads on the bed…especially the ripple one. I think she has a wonderful color sense…i.e., what goes together…without being too wild. Lovely home thanks so much for sharing with us! I love the colors, just not so much all the “stuff.” But it’s her house, not mine! Not my taste, but she has some unique pieces that I like! I am not one for all white/beige/cream walls and decor either, but I do find this a bit more than I would care to do. BTW, I like your new profile picture, Julia! I love it! No I couldn’t live in it but I wish I had a friend that’s home was like this. What a FUN, interesting place to visit. I hope this means we’ll get back to a splash more color and a more artsy fartsy decor. People have been taking things way too seriously for me when it comes to home decor. Cute for a couple of college roomies. 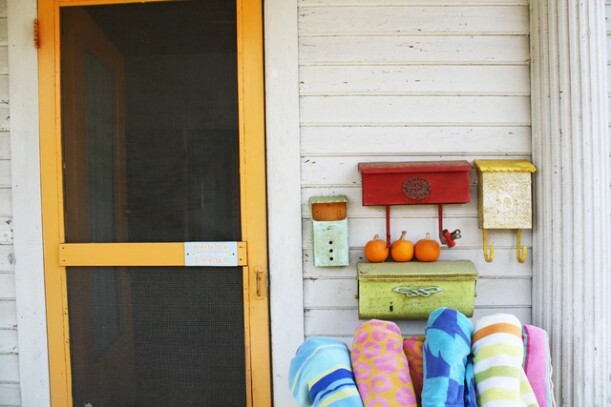 I love the fact that there is peeling paint on the front porch and door ways. My face expression is Perfectly Imperfect and this house proves it. Looks like a fun place. And if it makes her happy, than that’s all that matters. Personally, I need a more calm atmosphere, and I think all that bright color would make me nervous feeling inside. LOVE IT!!! I am SO tired of beige, white, and gray. I use color all over my house, but it is a Craftsman bungalow so my colors are muted. And my woodwork is all natural; if it was painted white I would paint the walls bright colors and have a rainbow in my house!!! It’s not something I’d do for my own home, but I love it! I only wish I could pull together colors so well. I love it. I would be happy to live there. I love too how all the fun, vibrant color distracts you from the old house imperfections that would probably annoy me if it were all in white and neutrals. I love those bright colors, but all of the patterns and stuff she has going on is too much for me and I couldn’t live here. Wow. That is really, really fun and awesome. But you know how people want their homes to “rise up and greet them”? This one rises up and smacks you around a bit!! She made a chandelier out of Barbie dolls in her girl’s room. My children would have loved living in a house like this when they were younger. So bright and colorful. I wonder if this is the Elizabeth Chapin whose sister-in-law is Laurie Smith of Trading Spaces? If so, wonder what Laurie thinks of this space – definitely not her aesthetic! Interesting! I had no idea Laurie Smith had a sister named Elizabeth Chapin, so I’m not sure. I used to love Laurie’s rooms on Trading Spaces! Too much color for me, but it still makes me happy when I see it. I envy people who are so comfortable with lots of bright colors and paterns, the ones I know who like that sort of decorating are all very creative. Me on the other hand…I just painted my bathroom greyeige..sort or a grey/beige. Shows how colorful I am! WOW! You do not need a light in that bathroom! Holy lime green! It’s very interesting and you have a great idea.I can also say that it hast oo much color for me, but it still makes me happy when I see it. I envy people who are so comfortable with lots of bright colors and paterns, the ones I know who like that sort of decorating are all very creative. Hey thanks for the shout 0ut on NO WHITE rooms!! I still love my kitchen. I have started a new blog about color and my love of 60’s and 70’s decor. Please come on over for a visit. I love this house! It feels bold, warm, fun, chic and as though it wraps you up in its owner’s personality. Ms Chapin makes her color scheme look easy, but this look is terribly difficult to get right. The bold colors are beautifully balanced by the neutral timber floors and white cabinets. It’s gorgeous and I could live with that! Thank you for the mention, glad so many people love this home as much as I do. I could handle this much color in my home, but not on the walls. I like gallery white walls so I can change out art. I could easily (and in some rooms do) have this much color in bedding, accessories, art, and frames. I love her house! Not my style but what fun! This house is the epitome of the well-known phrase (and marketing strategy): Keep Austin Weird! While it isn’t where I’d personally want to hang my hat ( it’s anything but calming), I’d enjoy visiting! And, yes, I’m bored with gray . And Ballard Beige. And white and black with apple green or red accents. Bored stiff. Tired of shabby chic, pseudo french, and country minimalist. Tired of chalkboards, burlap, and feed sack pillows. Had quite enough crowns, birds, numbers, and subway signs. 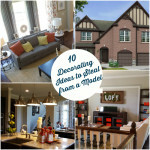 This house may not be my style, but it sure isn’t cookie-cutter! I love that things don’t ‘go together’. Homes should give off a vibe of having evolved over time, and with the aquisition of found objects collected for their appeal . . . and not just for how well they would take a coat of Heirloom White spray paint. This makes Betsy Johnson look tame. I absolutely LOVED every bit of this house! All that wonderful eye popping color just makes you smile! 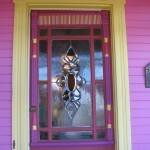 Your home should be a reflection of you, and I bet the owner of this house is every bit as colorful and fun! Wonder if she could come to my house and recreate this?!!!! 🙂 Thanks for sharing! It is a little too busy for me but it definitely does work. This is SO Austin! Love it.